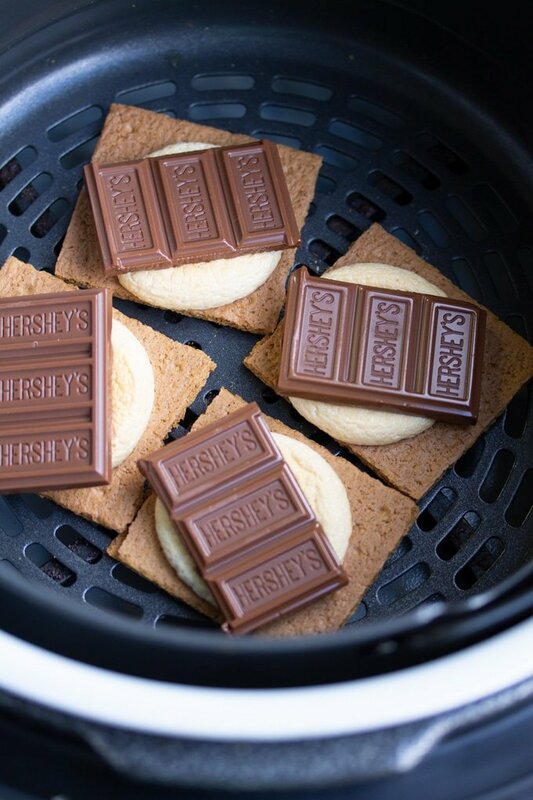 When it comes to S’mores, you don’t need a campfire when you have an Air Fryer. Here’s how to make Indoor S’mores in an Air Fryer. I love chocolate desserts. From brownies, to hot chocolate, to cookies with chocolate in them…Chocolate is my weakness. Now when you add Graham Crackers and a roasted marshmallow…I’m in Bliss! Yes my friends, I’m talking about delicious s’mores. The wonderful campfire treat that involves roasting a marshmallow over an open fire and them smashing it between two graham crackers and a piece of chocolate. I have days when I’m craving this campfire dessert. But in no ways am I going outdoors to create a fire to roast two marshmallows. 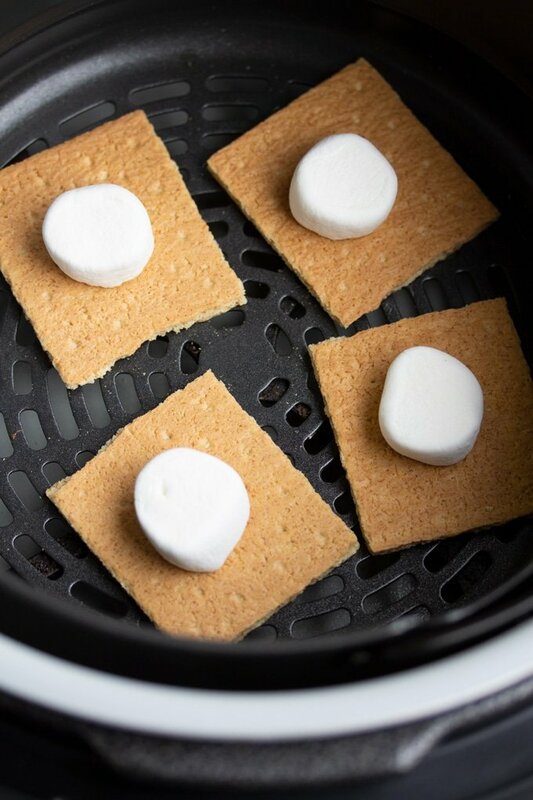 That’s where my air fryer comes into play and these air fryer s’mores come to life. 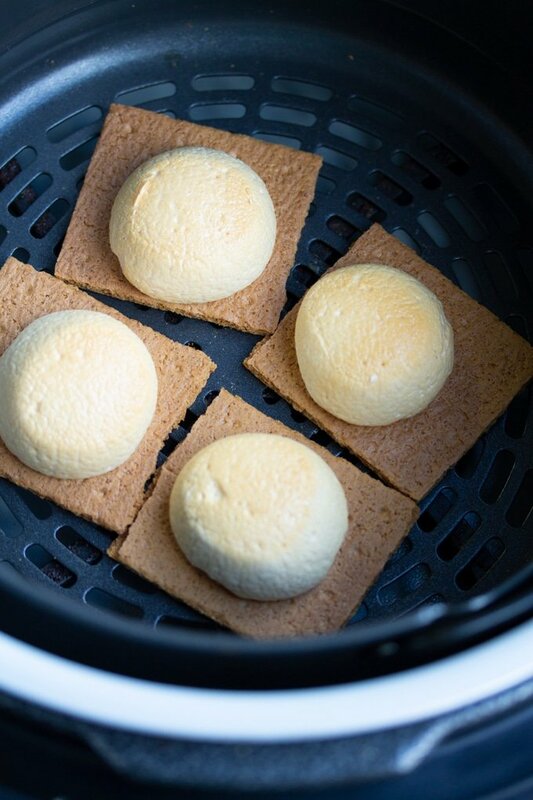 First, you’ll grab a few Graham Crackers and snap them in half and lay them in the bottom of your Air Fryer. 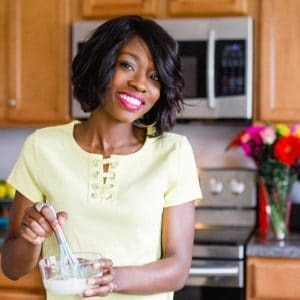 For this recipe, I use my Ninja Foodi Pressure Cooker/Air Fryer to make these s’mores. I actually tried them in my Phillips Avance XL Air Fryer and I found that my graham crackers moved around a bit. My guess is that the fan in my Phillips is super strong. Then I grab medium sized marshmallow and break them half. I then place the sticky side of the marshmallow on the graham cracker sides. That way, my marshmallows stick to the graham crackers and won’t blow away during the air cooking cycle. Then I close my Air Fryer and cook on 390 degrees Fahrenheit for 5-7 minutes. I found that in my Ninja Foodi, I have to cook around 7 minutes to get a nice roast on the marshmallow but it’s only about 5 minutes in my Phillips. I’d recommend checking for brownness after 5 minutes. 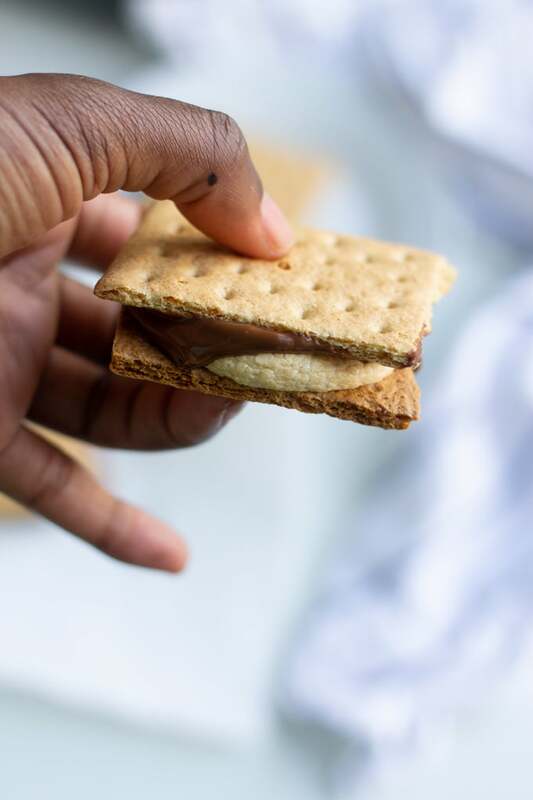 Once your marshmallows are nice and roasted, place a piece of chocolate on top, followed by the other side of the Graham cracker. Different brands and sizes of Air Fryers cook differently. Some marshmallows will roast quicker than others depending on the air fryer. I recommend checking your s’mores after 5 minutes. They are done when the tops are a nice brown color. We made these by adding the chocolate before the air frying cycle and after. My 10 year old taste tester and I decided that the chocolate was best added after. Who needs a campfire when you have an Air Fryer to make these delicious S’mores. Place Graham cracker halves in bottom of Air fryer. Take sticky side of broken marshmallow and place it on the Graham Cracker, pushing down a little so it sticks to the cracker. Close Air Fryer and cook on 390 degrees Fahrenheit for 5-7 minutes, or until the tops of the marshmallows are a nice golden color. Overall cook time will change depending on the air fryer size and model. Check on s'mores after about 5 minutes. These S'mores were made in the Ninja Foodi Air Fryer. Is there anything an air fryer cannot do?! This is so fun & tasty! I have heard so many good things about the air fryer that I need to consider buying one, this smores look so good! Love, love, love this idea! Can’t wait to try it out in my air fryer. So YUMMY! 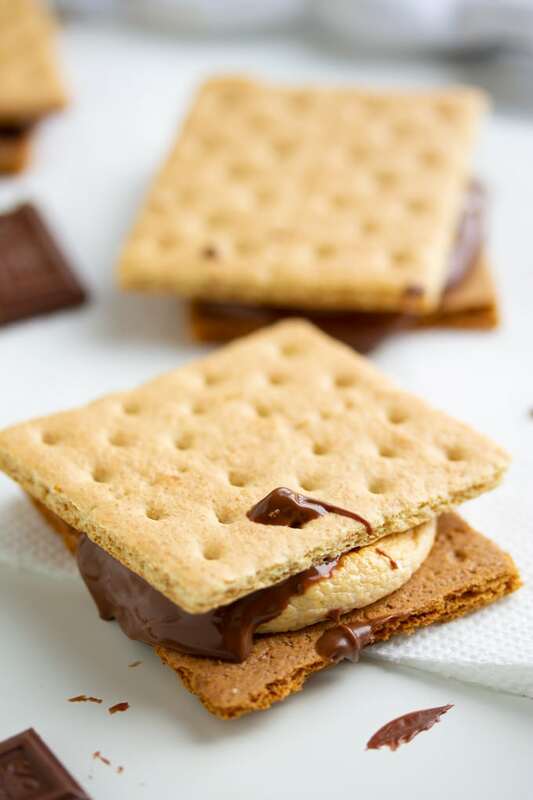 Using an Air Fryer is a brilliant idea…so much better than trying to do it in the fireplace when you’re craving smores! This is genius and they look soo good!